He also thinks a few glasses of whiskey a day keeps the doctor away. It turns out your worst vices won’t kill you, at least according to the country’s oldest veteran. 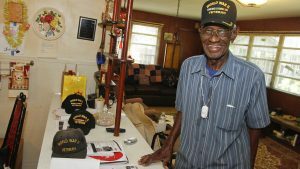 Richard Overton not only survived World War II, but he’s since celebrated his 110th birthday, all while enjoying life’s guilty pleasures. In a short film featured by National Geographic, the Austin, Texas, resident reveals that he sometimes smokes more than 12 cigars a day, and drinks four glasses of whiskey in the morning. “It makes you feel better,” he says. We can’t disagree with that. Not a whiskey lover? The supercentenarian prescribes to the “Overton diet,” saying, “I eat ice cream every night. It makes me happy.” His favorite flavor is butter pecan, if you’re looking for specifics. When he’s not in the mood for dessert, Overton also enjoys milk, fish, corn and soup, which is underrated in his opinion. Overton isn’t the only senior citizen spilling the beans on a long life. Ruth Benjamin, 109, credits bacon for her longevity. The 101-year-old Eunice Modlin eats two pieces of dark chocolate every day. All in all, the consensus seems to be do (and eat!) what you love, with maybe a little moderation. Just don’t tell Richard that.